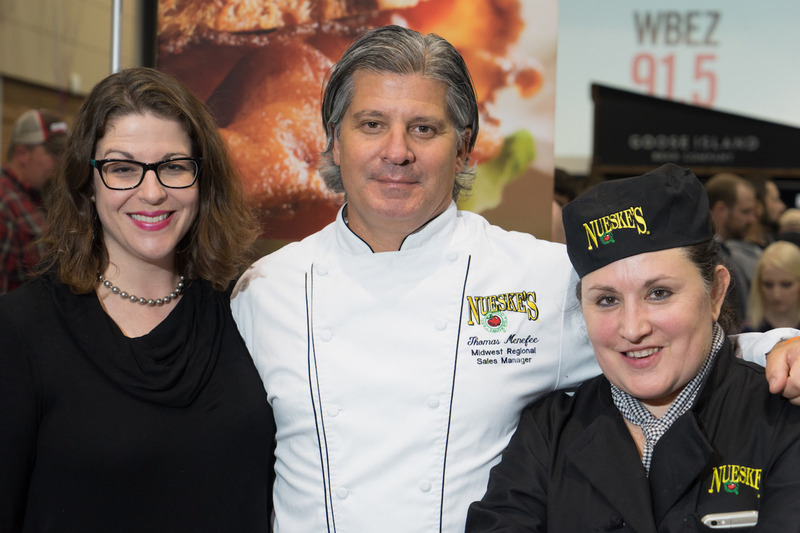 What can you say about a partner like Nueske’s Applewood Smoked Meats? For ten years in a row, they have been the official bacon of Baconfest Chicago, shipping 50 lbs of their delicious applewood-smoked and cherry-wood smoked bacon to each of our restaurant partners to use in their dishes. Since 2009, not including this year, they’ve shipped more than 46,000 lbs of bacon from their family smokehouse in Wittenberg, WI to chefs all over the Chicagoland region. Each chef has transformed it into a unique and creative dish which they’ve brought to the UIC Forum to share with our guests. 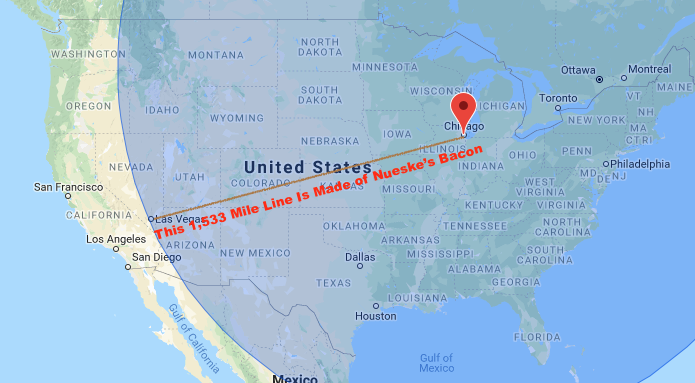 If you were to slice all that bacon and lay each strip end to end, you’d be looking at a bacon strip 1,533 miles long. That, as it happens, is almost exactly the distance as the crow flies from downtown Chicago to the Las Vegas Strip. What a country!!! 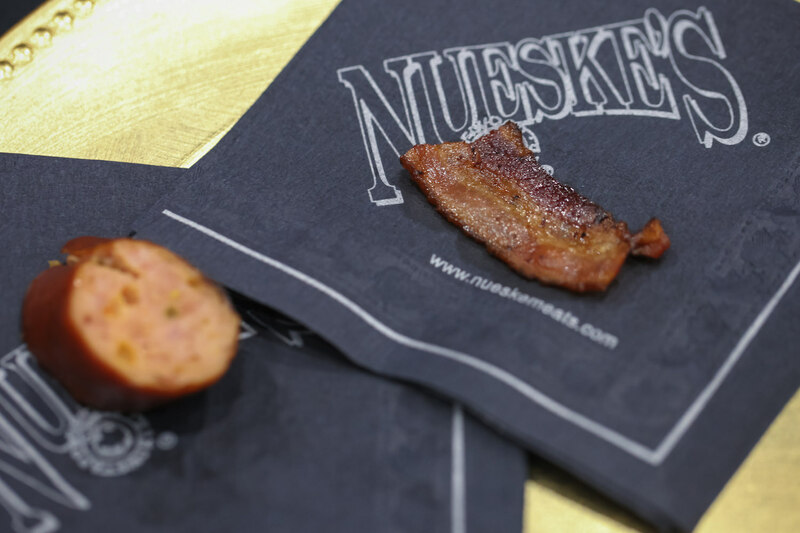 We can’t say enough great things about Nueske’s—both the people AND the bacon. Quite frankly, they make Baconfest Chicago possible! Baconfest Chicago 2018 happens Friday and Saturday, 4/6–4/7. You can still snag advance-purchase tickets, but they won’t last forever! Come along for a ride on our great bacon highway! 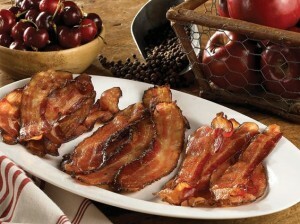 Nueske’s Applewood Smoked Meats has been creating fine nationally-acclaimed Applewood Smoked Meats since 1933. Nueske’s is located in the village of Wittenberg, Wisconsin and the Nueske family’s original smokehouse still stands in front of our company store at 1390 E. Grand Ave., Wittenberg. Nueske’s Applewood Smoked Specialties are well-known for their signature sweet, rich smokiness and consistently high quality—something which can be acquired only through the time and patience taken to slowly smoke hand-selected cuts of meat over glowing embers of genuine applewood. Each slab of Nueske’s Applewood Smoked Bacon is hand-trimmed and smoked over applewood logs for a minimum of 24 hours, allowing the signature smoky flavor of Nueske’s to develop slowly and permeate the entire cut of meat. If you’re a chef or foodservice professional looking for a family smokehouse that brings you premium smoked meats with a nationally-recognized flavor, Nueske’s offers a complete line of Applewood Smoked Ham, Bacon, Sausage, Pork and Poultry products, all smoked in the Nueske family’s traditional manner—over glowing embers of sweet Wisconsin Applewood or Cherrywood—and packaged in convenient foodservice sizes for any size kitchen operation.